The Audi Q8 will arrive as the most prestigious model of the Audi SUV range. Audi’s latest creation is a blend of a coupe and SUV, rivalling the likes of the swanky Mercedes GLE Coupe, Range Rover Velar and BMW X6. The Q8 joins the seven-seat Q7 as part of the German manufacturer’s most luxurious sports utility vehicles selection. Although the Q8 will outshine the Q7 in luxury, it does not compete in terms of space. A smaller body, 5-seat restriction, yet more expensive price tag, may make the sister model of the Q7 a less attractive option. It may be compact in comparison to the Q7, but a bold grille, slender LED headlights and huge 21-inch wheels amount to a car which is bound to stand out on the road more than any of Audi’s other flagships. A prominent aesthetic continues through to the Audi Q8’s interior. The dashboard homes three neat infotainment screens (two of which are touch-screen), similar to those in the high-end A8. The upper screen is used to control the infotainment and navigation, while the bottom screen manages the heating, ventilation, air conditioning and comfort controls. All materials decorating the elegant interior, including aluminium trims and glossy plastics, carry Audi’s established high quality. Behind all of this is an equally impressive engine – the 282 bhp 3.0-litre diesel V6 (labelled a 50TDi) is a Quattro all-wheel drive. The figures from the new NEDC testing reveal it can accelerate from 0-62 mph in an impressive 6.3 seconds and brags a top speed of 144mph. A smaller 45 TDI diesel and 55 TFSI petrol are also expected to join the 50 TDI in early 2019. 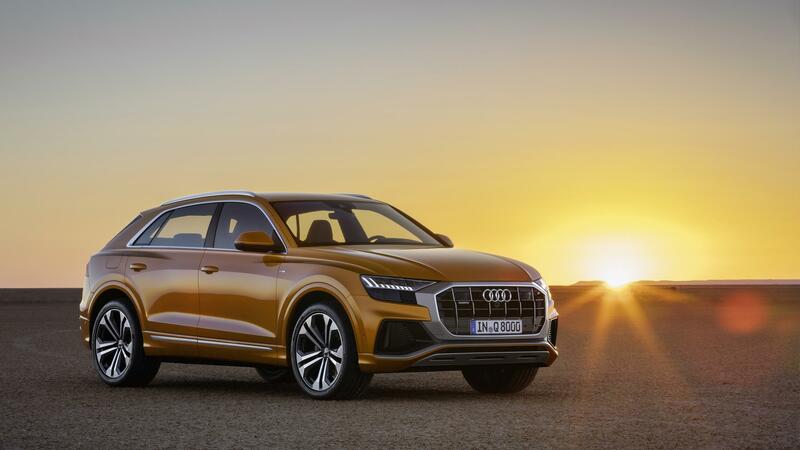 The Audi Q8 will be available to order later this Summer. Click here To view all Audi models currently available at Hippo Prestige.